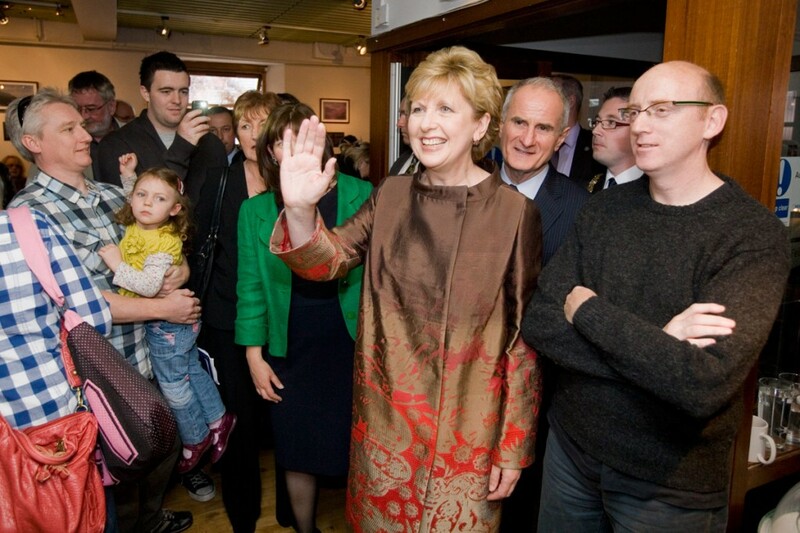 JOINERS, plasterers and painters made way for television crews, reporters and distinguished guests as President Mary McAleese officially re-opened the refurbished Cultúrlann this week. Having had a sneak peek at the £1.9 million project the week before, the Andersonstown News eagerly joined the throng that had gathered on the smart new patio area outside the Irish language cultural hub to await the President’s arrival and the cutting of the ribbon at the new glass-fronted Gerard Dillon ground floor gallery. The air at Broadway was filled with the sound of traditional Irish music and the smell of home-cooking from the award-winning Caife Feirste. With the threatened rain considerately holding off, the President drew up at the entrance to the new building to be welcomed by Cultúrlann Director Eimear Ní Mhathúna, who gave the President and her husband, Dr Martin McAleese, a guided tour of the building before thanking all the funders who made the beautiful new extension a reality. “I would like to thank the designers, architects and all the staff here who worked tirelessly to finish the extension we are standing in today,” said Eimear. “I want to thank former West Belfast MP Gerry Adams and SDLP leader Margaret Ritchie for their support, and Belfast Media Group Managing Director Máirtín Ó Muilleoir, who never ceases to remind the whole world about the Cultúrlann and the importance of our Gaeltacht Quarter. Eleven months of hard work had come to fruition as the President addressed the crowd, saying it was a “fantastic example of the new married with the old and the architects and builders have done a fantastic, fine job. It’s a joy to be part of this”. She went on: “The Cultúrlann emerged 20 years ago out of the dark shadows of sectarianism to make the statement that the future was going to be different. Equality, justice and parity of esteem could be built and would be built. Five major funders came onboard and made it their responsibility too. ‘The Irish language has such potential to be such a source of good, the wells of richness that exist within the Irish language and culture have such wonder in them and such opportunity. “How can we know as people who we are unless we know something of this language? It is the richest, the deepest, the most enduring on this island. When Queen Elizabeth II visited this island the first words she spoke in public were Irish. Earlier that morning I had given her a 400-year-old Irish phrase book that had been commissioned by Queen Elizabeth I so that she could show respect to those that came to visit her in the instances when Irish was their first language. Speaking at the event, West Belfast MP Paul Maskey said the unveiling of the Cultúrlann was “a great day for West Belfast”. “It is fantastic to see this flagship building relaunched today and it’s a building that the people of this area can be proud of. “I believe it will bring a lot more people and tourists into the Gaeltacht Quarter and to have President McAleese visit here as one of her last duties is really something,” he said.